•Package units are unique, all-in-one systems that supply both cooling and heating equipment in one "package." These units sit on the ground or rooftop outside of your home or business. 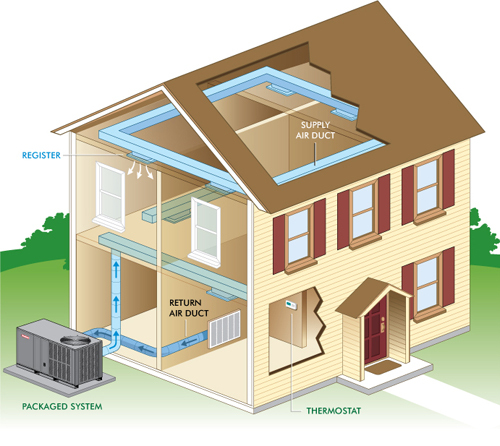 •Packaged heat pumps offer heating and cooling using heat pump technology. •Packaged air conditioners cool your home and can heat it as well, using electrical strip heat. •Packaged gas-electric units offer all-in-one air conditioning and natural gas-powered furnace performance. •Space efficiency.Unlike split-system units, all components of a complete heating and cooling system are contained in one location, making package units ideal for situations in which indoor space is at a premium. •Energy-efficient heating and cooling performance. All Amana package units offer 13 SEER or higher cooling performance. Our package gas/electric units offer 80% AFUE heating performance, as well.